Ingredients: For 4 persons: 350 grams of rice, 1 onion, 4 tablespoons olive oil extarvergine, 200 gr of peeled tomatoes, 100 gr dilenticchie already cooked, 1 bay leaf, salt. Difficulty: Easy. Preparation time: 20 minutes. Preparation: Chop the onion and fry in oil, add the tomatoes and cook for a few minutes then add also the rice, stir and cook. Sprinkle with a few ladles of hot water, stir, add salt and cook for about ten minutes, adding hot water as manoaltra. 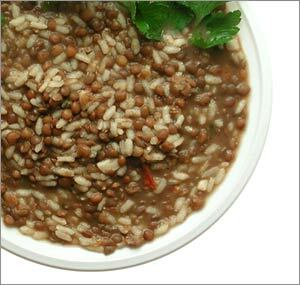 Put the lentils in the saucepan and bay leaves and cook the risotto.